Launched in 1986 and in production until 2004, reference 3970 replaced reference 2499. Both models shared certain features such as pump pushers and down turned stepped lugs. However, reference 3970 presented certain details, enabling it to proudly step into contemporary horology. 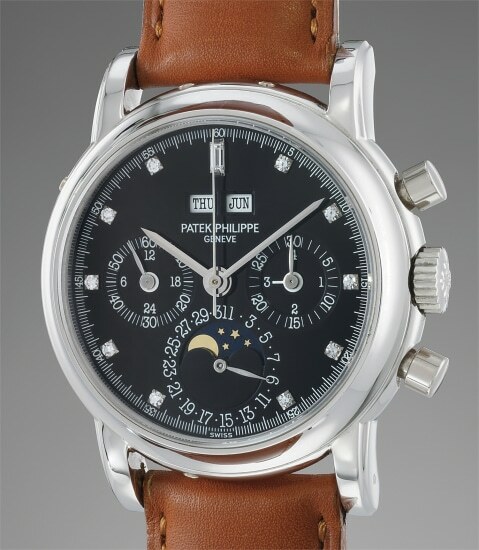 Patek Philippe replaced the Valjoux movement with a heavily modified Lemania 2310 ébauche dubbed CH 27-70Q. Furthermore, two new indications were added to reference 3970, a leap year indication and a 24 hour hand. The reference was divided into three series: the first series featured a snap on caseback, with applied gold baton indexes and feuille hands. The second series featured a screw-down, solid caseback, with the hallmarks stamped on the outside of the lugs. The third series featured a sapphire display back along with a screw-down solid caseback. This third series example is preserved in excellent condition. The letter E in 3970E represents "étanche" or "water-resistant". Most importantly, the inside rim of the sapphire crystal back carries the engraved reference 3970, as well as the movement and case numbers. The additional case back is furthermore engraved with the reference number and the case number.